In this review I will discuss my experiences with the Evohome system since I installed it at the end of 2014. The Evohome system was introduced in 2010. The 1st generation controller was equipped with a monochrome touchscreen, and used the rather bulky HR80 radiator controllers. 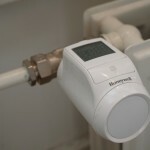 It was updated in 2013 to include a colour touchscreen and sleeker HR92 radiator controllers. 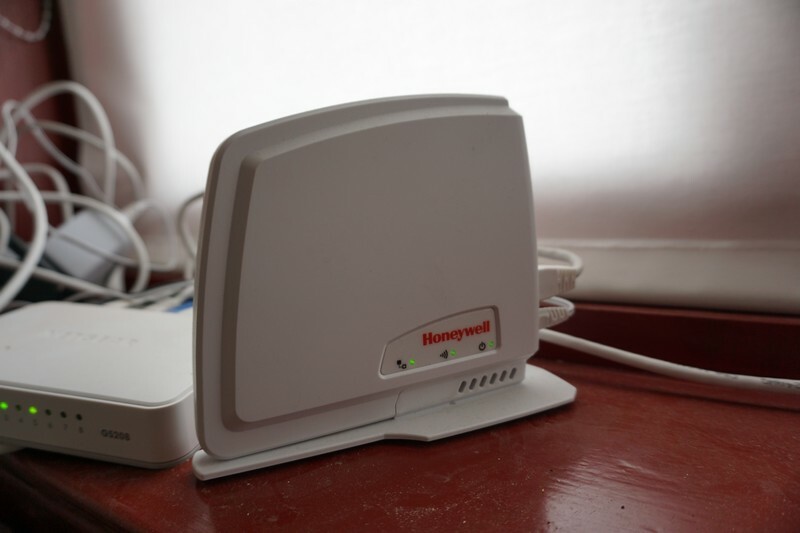 In september 2015 the 3rd generation was launched, which includes wifi, eliminating the need for an access gateway. The system under review in this article is the 2nd generation, but since not much has changed besides the integration of wifi in the controller, most of the contents should also apply to the current generation. First I will cover the installation process and at the end of the article I will discuss my experiences with the system in daily use. 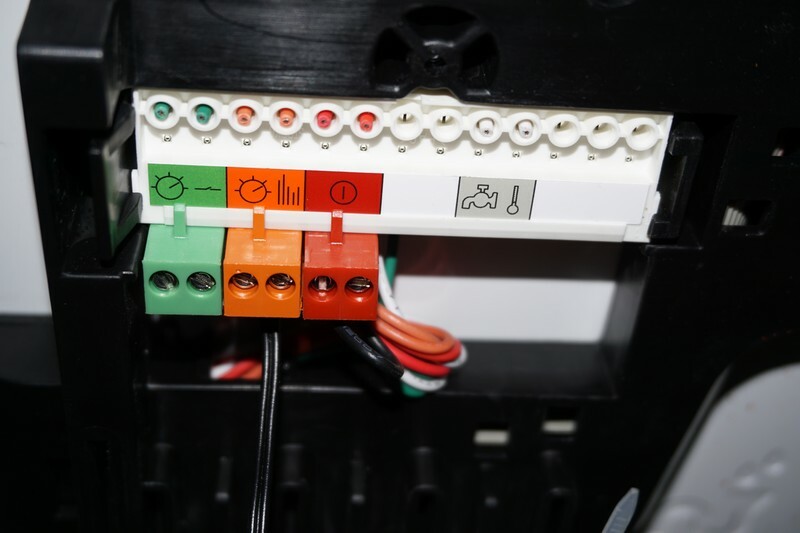 Connect the controller and Opentherm module to mains power and place batteries in the HR92 controllers. Create zones and connect the base unit to each HR92 controller. 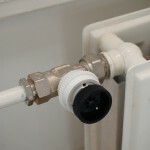 Replace existing radiator valves with the the HR92 units. 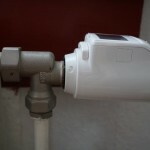 Perform communications test with radiator valves when installed at final location. 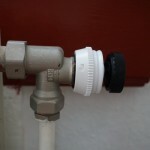 Install bypass (Comap 872B) to prevent damage to the pump when all radiator valves are closed. Power up the Controller other system components. 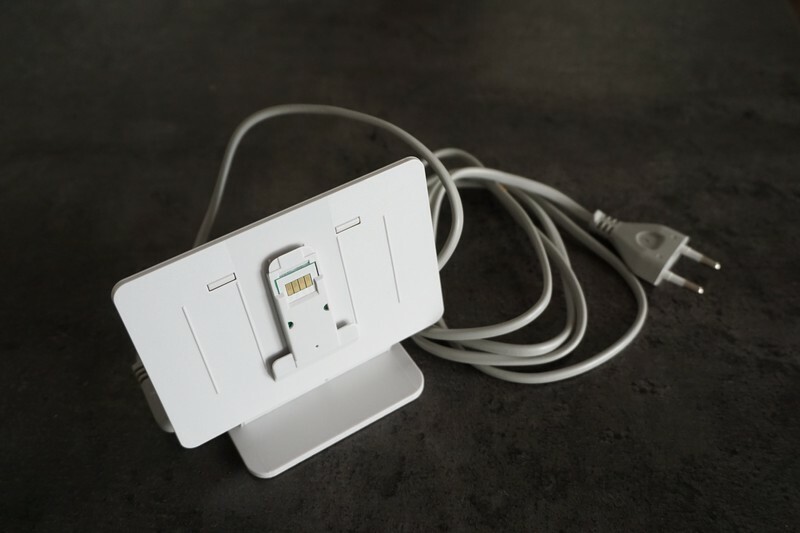 The main controller comes supplied with a table stand with built in AC adapter. The benefit of using the table stand is that there are no holes to drill in the wall. It is just plug and play. Make sure you place the unit away from radiators and door openings where drafts may affect the temperature reading. 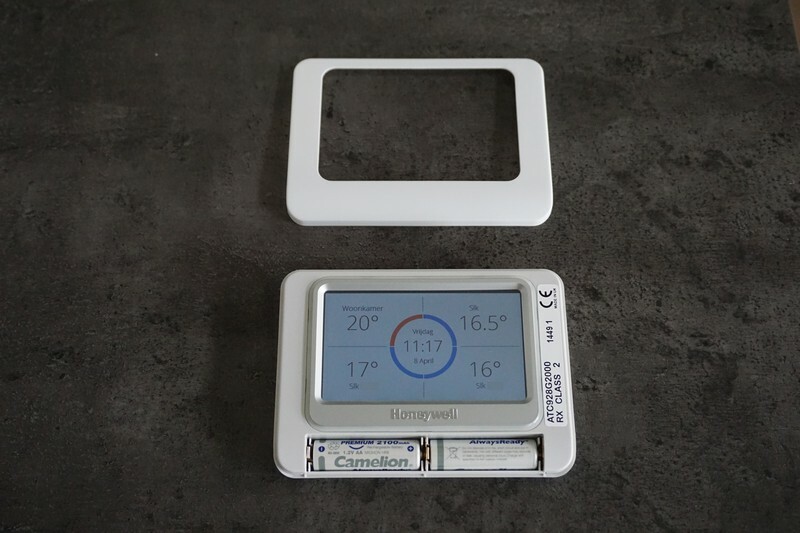 Honeywell also offers a wall mount kit. Since I prefer a wall mounted controller (less clutter) I used the ATF300 wall mount kit. This has to be purchased separately. 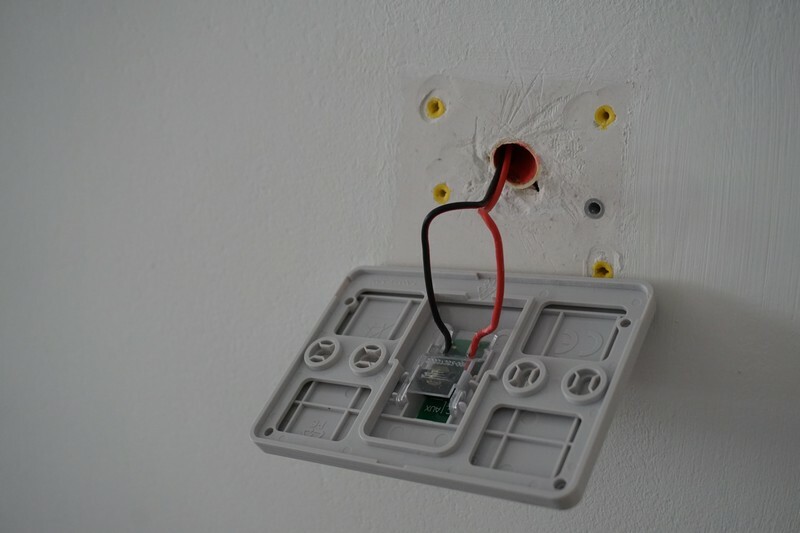 If a switch box is available at the position where you want to mount the controller, the AC adapter from the ATF300 kit can simply be placed behing the controller inside the wall. However, sometimes only an electric tube leading to the boiler is available. In that case the AC adapter can be placed near the boiler and connected to the controller using a low voltage supply cable. I placed the AC adapter in standard electrical box next to the boiler, as shown below with the lid removed. The controller also has 2 chargeable AA batteries, which serve as power supply when you take the unit off the wall for programming or other purposes. They can be replaced if necessary by removing the front cover. The HR92 radiator controllers are powered by 2 AA batteries, which are supplied in the kit. 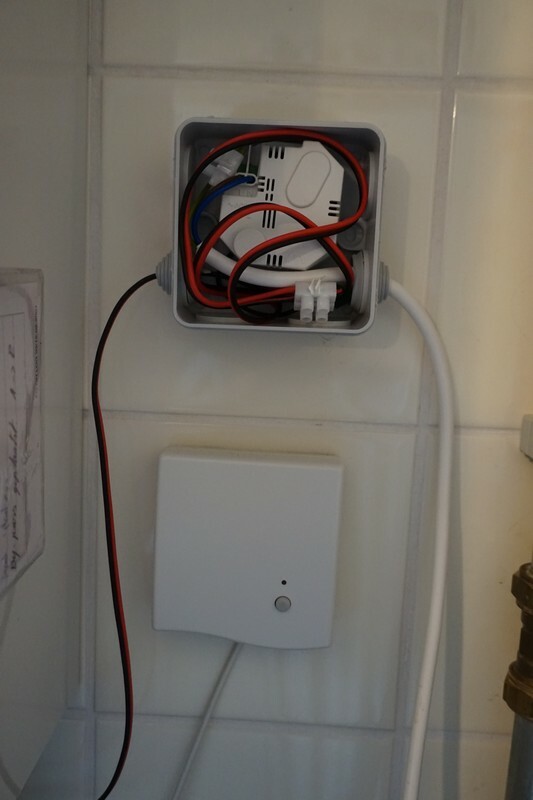 Also the internet gateway and Opentherm module should be powered up before starting the installation procedure. 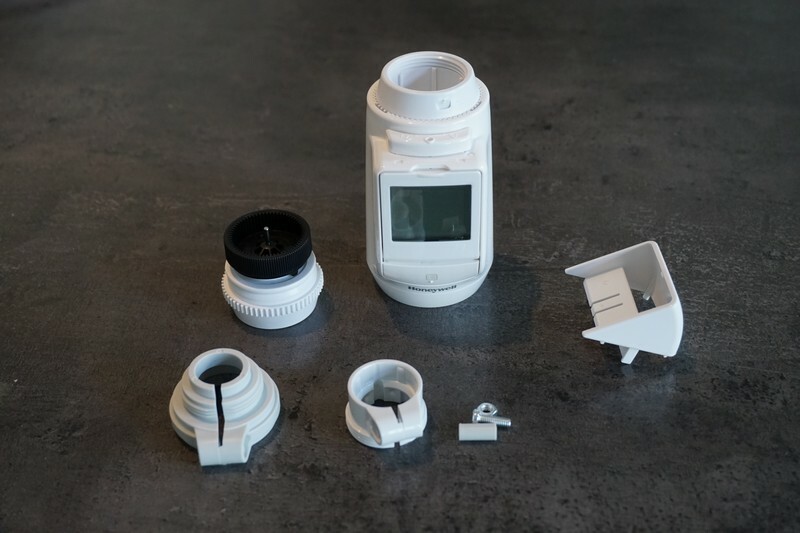 The components in the Evohome system communicate to each other using an 868Mhz signal. They each have to be registered on the main controller in order for the system to work. Typically this involves pressing a button on the device and setting the main controller in reception mode. Details are covered in the instruction manuals, so therefore I will not go through them in detail here. All available HR92 radiator controllers should be connected to the main controller. 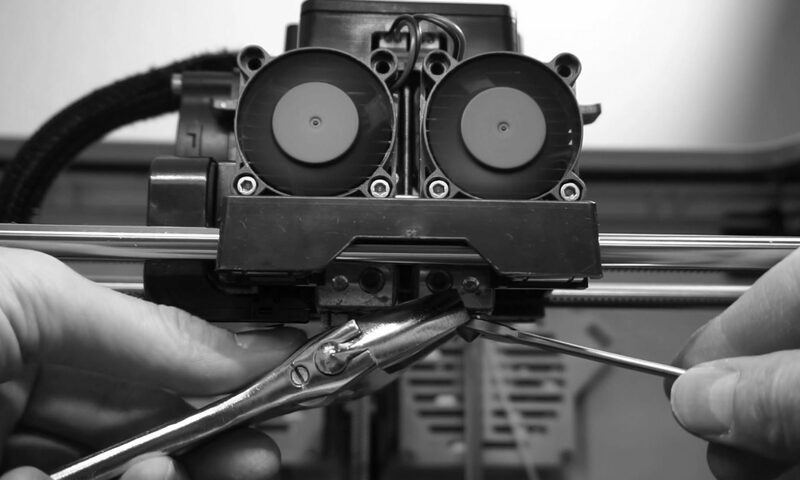 This can be done using a wizard, which guides you through the process of creating a new zone and binding the valve. It is also possible to manually add, delete or change an existing zone. The HR92 unit has an internal temperature probe which can be used to measure the temperature of the room it is installed in. However, when the HR92 controller is mounted under a windowsill or behind a curtain it is better to install an external temperature probe. A round wireless thermostat can be used for this purpose. It can be configured through a simple procedure to act as a probe in the Evohome system instead of functioning as a stand alone thermostat. 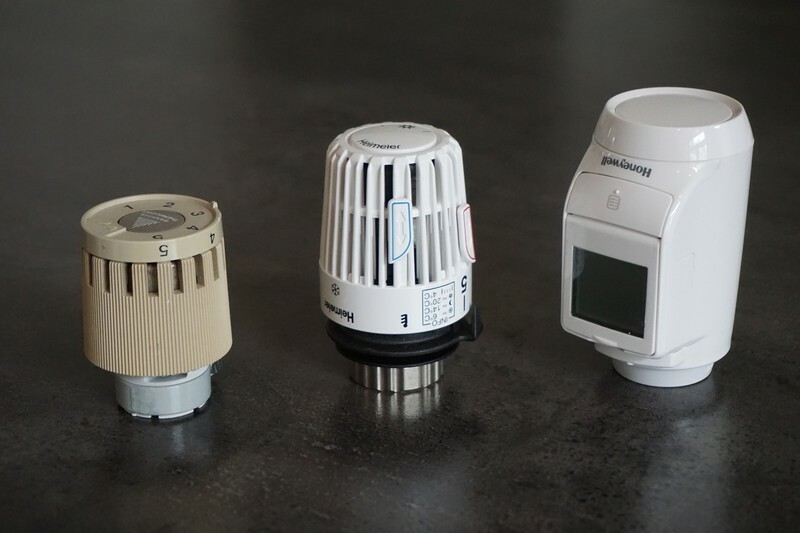 Initially I used the HR92 as temperature probe for all rooms except the living room, but found some bedrooms showed high fluctuations in temperature. 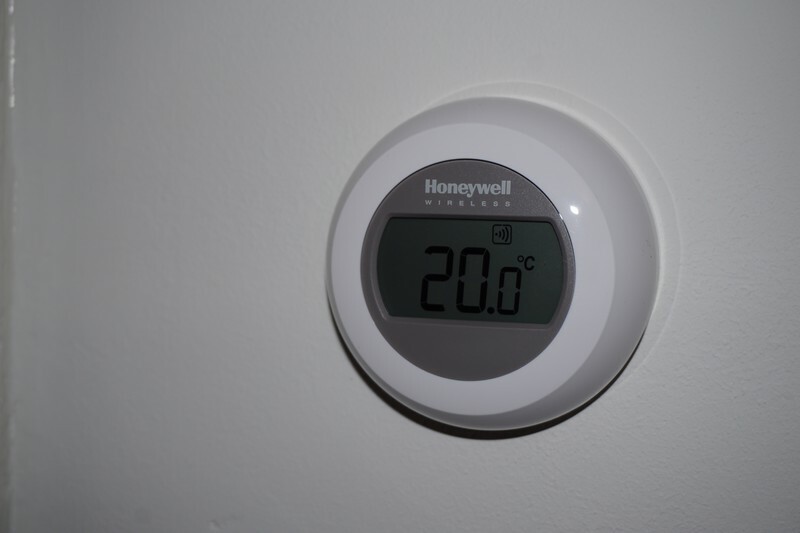 For these rooms I later fitted round wireless thermostats and included them into their specific zone. I found that I was unable to add the round wireless in an existing zone. The solution for this was to create a new zone, connect the HR92 to the new zone and add the round wireless. The old zone can then be deleted and you can rename the new zone to reflect the old name that you were used to. Since adding a round wireless is only done once I don’t see this as a serious issue. The internet gateway should be connected to the local area network using an RJ45 connector. 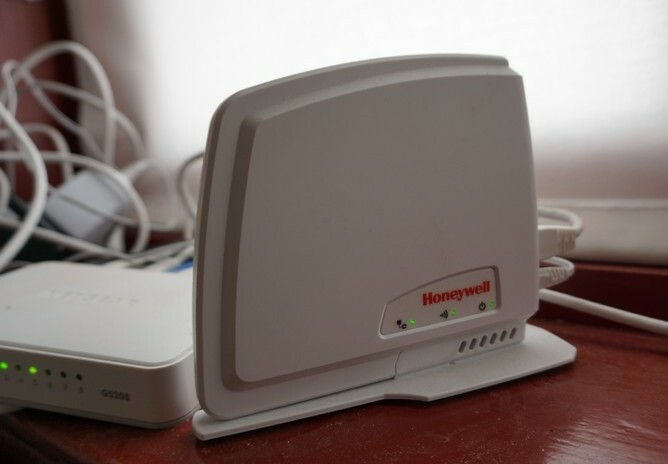 When this is done the wireless connection to the main controller can be established. The gateway does not have to be near the main controller to function properly. Since the communication between the gateway and the controller is also performed using the 868Mhz signal, it has a large wireless range. I installed the gateway on the third floor, with a concrete floor and 2 walls seperating both components and still the reception is fine. This means you should be able to place it anywhere in your home where you have a wired LAN connection available. The boiler powering my heating system is a Nefit HRC 30/CW5. It is a modulating boiler, but unfortunately this boiler does not have native support for the Opentherm protocol. Nefit does offer an Opentherm converter module, the EMS-OT. This module can be connected to the modulating input terminal. This is the orange terminal in the picture below. 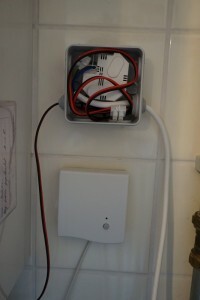 The other end of the module is connected to the Evohome Opentherm module. 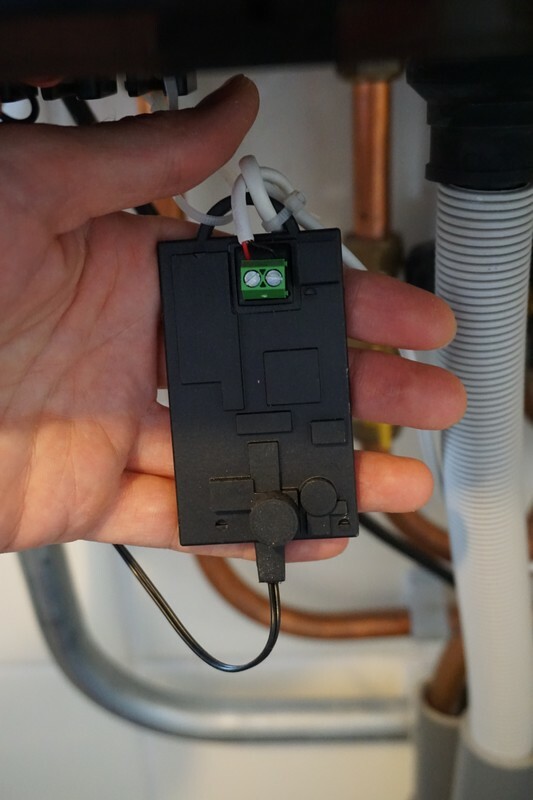 The Opentherm converter does have it limitations with regards to the supported error messages (for example I do not get a message from the Evohome when the boiler pressure is low) but otherwise it functions perfectly straight out of the box. Actually, since there are no settings possible on the converter it either works or it doesn’t, so I was lucky it fell in the first category. 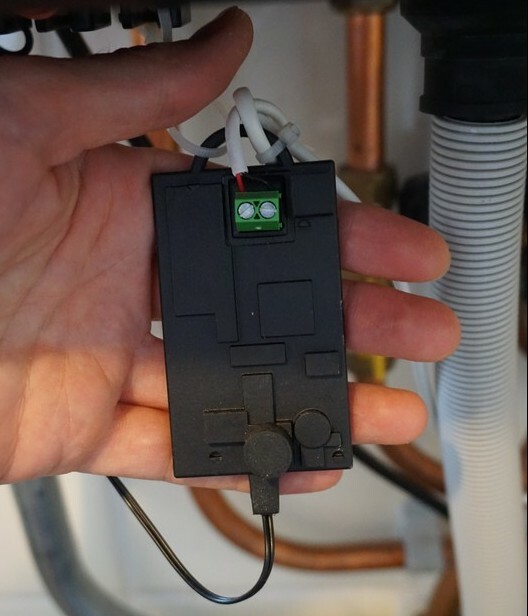 When the Opentherm module is powered up and connected to the boiler it can be connected wirelessly to the main controller using the binding procedure. 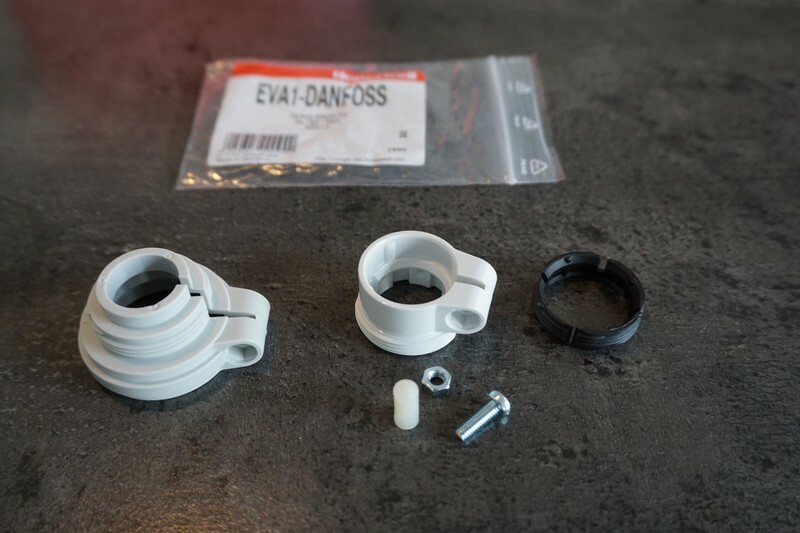 The HR92 is significantly bigger than the old RAVL danfoss type, but when compared to a new Heimeier M30x1.5 the difference is only about 1 cm in length. In practice the size difference does not really matter since you quickly forget about the valves controllers after they are installed. And of course it all depends on personal taste, but I think they look quite nice for a radiator valve controller. There is one more thing that should be considered when installing the Evohome system. 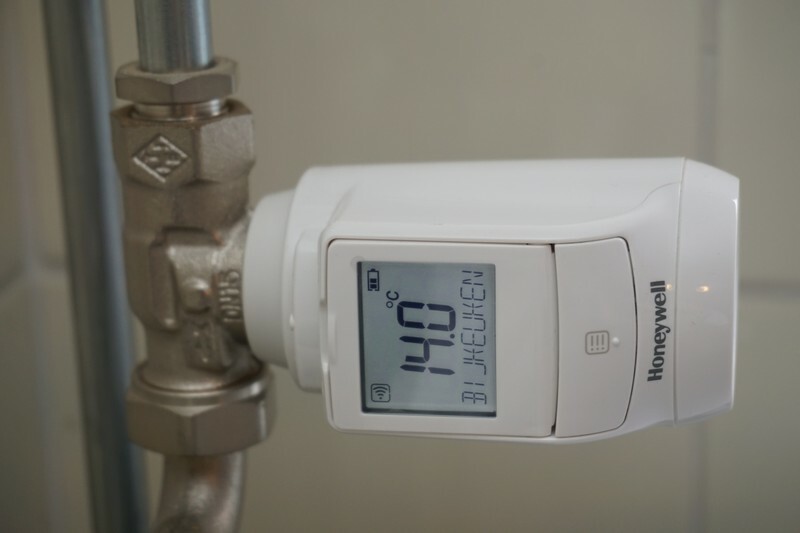 Even when none of the zones are requesting heat from the boiler and therefore all valves are closed by the HR92 units, the pump may still be activated from time to time. 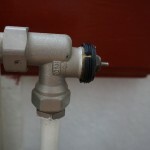 From experience I can say this leads to a very unpleasant loud humming noise, which sounds very unhealthy for the pump. There are 2 ways to deal with this. 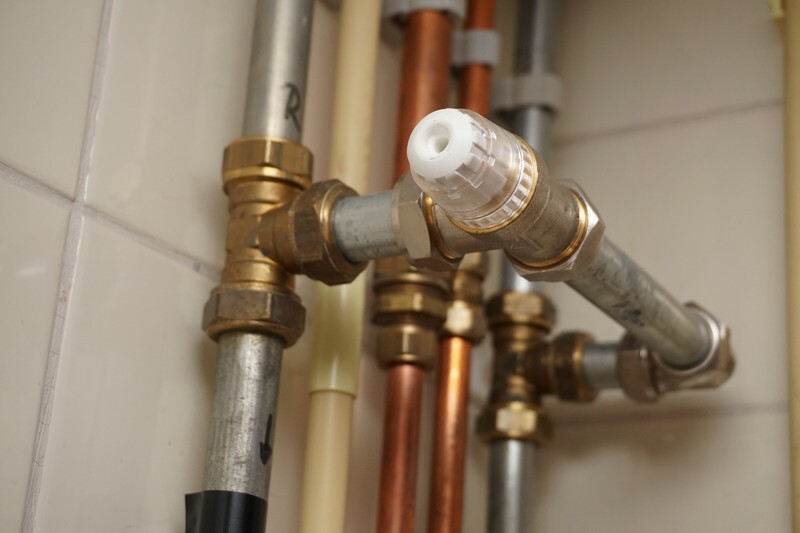 You can either leave one of the radiator valves always open, or an over-pressure bypass can be installed between the outgoing and incoming water line in the heating system. I chose the latter option. 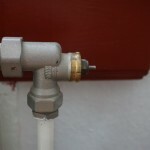 The bypass was installed by a plummer, who mentioned that it should be installed around 6 meters from the boiler if possible. In my case it could not be fitted at that distance, so it is now located at only roughly 2 meters from the boiler, but it still functions correctly. A Comap 872B differential presssure valve was used for the bypass. It can be adjusted to open at pressure differences anywhere between 0.1 and 0.5 bar, based in the system in which it is fitted. I used some trial and error to find the setting for my system at which it opened at the desired moment. 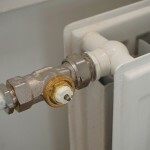 If the valve opens too early it will cause the boiler to stop heating triggered by high temperature of returning water (which did not flow through a radiator but was directly fed back through the bypass). The system has been in use for roughly 1 year and 4 months at the time of writing. In this period I have not experienced any major issues. A couple of weeks ago the batteries of the HR92 in the living room needed to be replaced. All other units are still running on the original batteries supplied with the kit. I am not very enthusiastic about the android app. Although it has all the functionality that I need, it simply takes too many clicks and swipes to change the temperature of a zone. With regards to the interface of the main controller I wish more advanced temperature monitoring was available. The interface only shows the current temperature but does not log any data. Despite some minor downsides I am very satisfied with the Evohome system. I functions flawlessly at it’s core task, which is to control temperature independently in multiple zones. The main controller is also very user friendly. I would not want to return to a single zone heating system. I realize this post was over a year ago, but if you are still looking to do more with EvoHome, I strongly recommend purchasing the HGI80 interface. This will allow you to interact with the system from your computer, controlling it and/or logging much more information that it natively can. 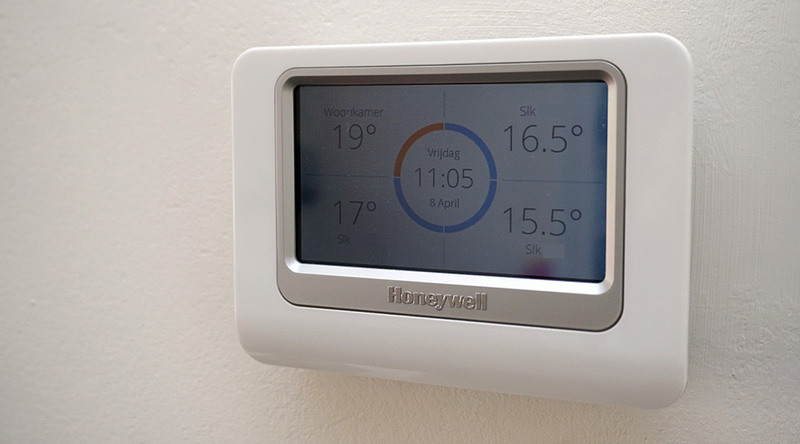 This can be purchased online here (wifithermostaten.nl/honeywell-hgi80-interface.html) and you can pair it up with a software called Domoticz available for free download here (domoticz.com/downloads/). With this setup you will be able to gain much more insight into how EvoHome is working for you.